This is 13 great tips for using a wood scraper, you’re a guide to discovering this amazing tool that may get you to throw out all of your sandpaper. I’ll show you everything you need to know, and you’re going to be very excited to try it out. Enjoy. A long long time ago, and a woodworking shop far away, there was no sandpaper. Relatively speaking, sandpaper is a pretty darn new invention. Along time ago, that just wasn’t the way you removed wood and smoothed out surfaces. Before sandpaper, sharp tools with razor edges were used for every aspect of woodworking. This was not just limited to major shaping operations. It also carried over to smoothing and refining the shape of a project. These are normally parts of the process that you use sandpaper for today, but a long time ago that just wasn’t an option. In truth, the way they used to do it can actually be a lot better than the way we do it now. You just need to know how. Here are all 13 tips, all in one place. I’ll go into each one of them in detail farther down in the post, and they are all very helpful for using a cabinet scraper. When I first got my cabinet scraper, and tried it out, I wasn’t impressed. It didn’t work very well, and it ended up in a drawer and forgotten for a while. In reality, it wasn’t that the tool didn’t work, it’s that I had no idea what I was doing with it. I didn’t even burnish an edge on the tool, so it wasn’t sharp, which is why it didn’t work. I also had no idea how to burnish a good edge, so I was set up for failure right from the start. That being said, the best tip I can give you is to invest in a good burnisher. 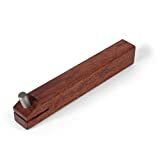 A burnisher is a tool that is used to put an edge on your wood scraper. The edge is the sharp part that actually does the work. Without this part, you might as well just rub a credit card over your woodworking project, because you’ll get the same results. There are a lot of good burnishers out there, but the best ones are set up in a way that you really can’t screw it up. The one pictured above is a great example, and I have the very same unit. Before you can burnish a good edge, the edges of the scraper need to be squared off really well. The easiest way to do this is with the file, and you can run the edges of the card along the file with the card standing straight up. Do you all four edges really well, and pay attention that you keep the card completely vertical during this entire process. It’s very important because you need a nice square edge to start with before you create the sharp part. A few passes back-and-forth across a flat metal file is really all you need to remove any existing burs and flatten the edges. Do all four sides, and then your cabinet scraper is fully prepared to be sharpened. Burnishing is a skill, just like any other. As I mentioned previously, you can buy burnishers that vary in the amount of learning curve. If you buy one of the burnishers that I recommend, it will be fairly easy to put a good edge on your scraper. That being said, you may like to use an old-fashioned stick burnisher, or you may just want to practice really well with the one you have, which is what I recommend. For this, you need to go to YouTube. Watch some YouTube videos on how to sharpen a cabinet scraper, and you will see a burnisher in action. Watch how it’s done, and pay attention. Watch several different videos so that way you can see exactly how to do it before you do it yourself. It’s very important to watch this stuff, because you pick up so much more in a video. It’s definitely worth your time, and they will answer a lot of questions that you might not of even known that you had about using your wood scraper. When you draw a burr off the edge of your scraper, it has a certain angle, or hook. This varies depending on the angle of your burnisher, and you can manually change that angle in some cases depending on what type of burnisher you have. If you have a variable burnisher, that lets you change the angle, then it’s definitely worth experimenting with different hook angles until you find the one you like. There are advantages to steep and shallow angles, and it effects the way you hold the scraper. If you have a single setting burnisher, then don’t worry about this part. Honestly, it’s really not that big of a deal until you use your scraper so much that you want to fine-tune your experience. Single setting burnishers give you the best setting for the average woodworker, so don’t worry. Another tip that super important is to bend the scraper slightly while you are using it. This has a number of different advantages, and not only does the tool work better, it also prevents damage to the surrounding area as you’re using it. The edges of the cabinet scraper have corners. If those corners dig into the surface of your project, they will leave quite a scratch. Thankfully you have a tool in your hand that can remove them, but you can solve the problem simply by bending the card when you use it. Bend the card forward at the middle, and use the middle portion of the card to remove material from the surface. This will keep the edges away, and will also focus the burr in the center of the card to do the most work. As you’re scraping, there is friction created. Make it a point to not go so fast that you heat the card up too much. If you do this on accident, you’ll find out really quick, or rather your thumbs will find out really quick. If you just go to town and start hogging off material with your card scraper, your fingers will tell you right away that you messed up. It generates a lot of heat, and it will burn the pads on your thumbs very quickly. This definitely isn’t the fun part of woodworking, so go quick enough that you’re not wasting time, but don’t go so fast that you feel the card heating up to the point where you can feel that it’s uncomfortable. Just as with any other type of edged tool, the depth of past you attempt to make in one try will have a big affect on how well the tool works. Just like trying to dig out everything with one pass of a chisel, you can create the same problem with your scraper. Instead of trying to take it all in one shot, makes several thin passes with the scraper, just removing a little bit of wood from the surface each time. As you do, you’ll notice that your results are far better. Not only will the material come off more easily, it will also happen much more quickly. You’ll be able to see your progress, and you won’t make any mistakes that are super hard to correct. Making thin passes and it’s just better overall. I told you about the YouTube videos earlier, and video is a very powerful medium. You can also benefit from reading articles and tutorials. This is a just a little different way of presenting the same material, and you can learn quite a bit. If video is not your thing, maybe the written word is. 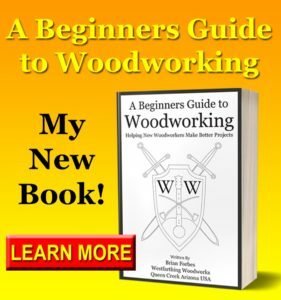 There are a lot of excellent tutorials on the internet about how to use a wood scraper, and you can learn simply by reading and applying those techniques in your shop. When you consume information in different ways, you increase the saturation that your brain experiences with the material. Sometimes it takes something presented in a different way in order to make it stick. So combining videos with written instructions is a good idea. One of the best tips that I can share with you is that your burnisher is not something you should use just once in a while. Rather, you should use it quite often. In fact, the burnisher is great at restoring your edge whenever you need it. Burnishing is a little bit different from sharpening. When you initially draw out your edge, it’s fairly straight. After a while it can get a little bit out of shape. That’s where the burnisher can restore that shape for you. 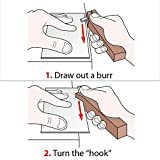 Run the burnisher along the edge of your cabinet scraper, and don’t quite put the same amount of pressure on it as you normally would to draw out the initial burr. At this point, all you’re doing is straightening out the burr that you have. You’ll notice on your next few passes that the card scraper works much better. All you had to do is stop for a few seconds, and you significantly enhance the workflow. It’s worth it. This is something to be careful of when you’re working with any tool with a sharp edge, but a cabinet scraper is worth special mention because it’s kind of sneaky. It’s just a little metal card, so the edge doesn’t really seem sharp. All you have to do is run your finger the wrong way across it on accident, and you’ll discover that your little card can bite. Be careful of the edges, I make sure never to run your fingers in the same direction as the edge. If you run your finger perpendicular to the sharp edge, you’ll be able to feel the quality. After you’ve been working with your scraper for a while, you may want to try different thicknesses. Just like anything else, there is variation in the type of scrapers that you can buy, and it’s worth taking a look at the differences. Most of the time, the main difference is the size of the card, and the thickness. Focusing on the thickness, cards like this don’t tend to flex as well as thinner cards, so they’re better for large flat surfaces than the more flexible cards. Thinner cards are great for removing very fine layers of material, and getting into areas that almost have a little bit of a curve to them. Again, try a few different thicknesses and see what you enjoy using the most. On top of different thicknesses, wood scrapers also come in different shapes. You can experiment quite a bit with the different shapes and sizes, and find scrapers that work in different applications for your woodworking style. It’s definitely worth trying a few different shapes and sizes. Grab a multi pack that has several different types of scraper in them, and try them all out. You’ll never know until you try and you may fall in love with something you didn’t think you would even like. When you find a combination that makes you happy, look around for similar scrapers and bring some more of them into the shop. This will allow you to burnish an edge on several scrapers at once, and you can switch from unit to unit as needed. There are a lot of different manufacturers that make cabinet scrapers for wood. That being said, they are not all created equal. Since anyone can sell them, sometimes you end up having a very poor quality product being sold for a discounted price. In the beginning, so you don’t ruin yourself on using a scraper, pick a name brand that you recognize. There are several good name brand companies that make cabinet scrapers, and you will get a much more consistent quality. Know in the beginning that you are starting out with a tool that does work well once you understand how to use it. Understanding this makes you more confident, because you’re not worried that your bargain basement tool is betraying you. Now that you know all these amazing tips about using a wood scraper, it’s time to head out into the shop and take action. Look up a great set of cabinet scrapers, and buy them so you can try them out. Wood scrapers are not expensive. Even in the bigger sets, they’re still very economical. Also, make sure you pick up a burnisher while you’re at it, that way you can create a nice edge and really get the full experience for the tool. Practice putting an edge on your cabinet scraper, and then start watching some videos and reading some tutorials so you can get the quick hang of how to use it. After that, start making some saw dust. You’ll really get a kick out of using a cabinet scraper for the first time. After you get good at it, you might kick your sandpaper to the curb for a very long time. 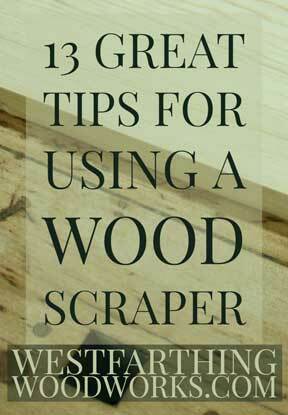 If you have any questions about these awesome tips for using a wood scraper, please leave a comment and I’ll be glad to answer them. Happy building.